It's not every day you get the chance to sleep in someone's vision, but that is exactly what Cruckbarn is – a self-realised labour of love built recently by architect John Williams and his business partner David Martin on a secluded plot of land high above the Herefordshire village of Wigmore, and with spectacular views over the county. John also owns the excellent Abbots Lodge B&B down the road, so he knows a thing or two about hospitality, and he has set up Cruckbarn to provide a delectable country escape that's perfect both for couples looking for a secluded bolthole or jaded city families who are after a country cottage for walking holidays and easy access to the Great Outdoors. An oak-framed, barn-like structure, with a vaulted roof (formed by the 'cruck' frame) straddling one giant room, it's above all an enticingly cosy place, with a log-burner fuelled by a plentiful supply of logs from the woods outside. There is a well-equipped kitchen with hob and oven, a washer-dryer, and a walk-in shower and bathroom. On the mezzanine there's bedroom with a king-size bed at one end, and an additional bedroom with a double bed and a single; the bathroom is in between the two. The building has wifi, but not much of a phone signal (which may be a blessing), and a Bluetooth music system and digital radio as well as a vinyl record deck for those (ahem...) of a certain age. But – deliberately – there is no TV. 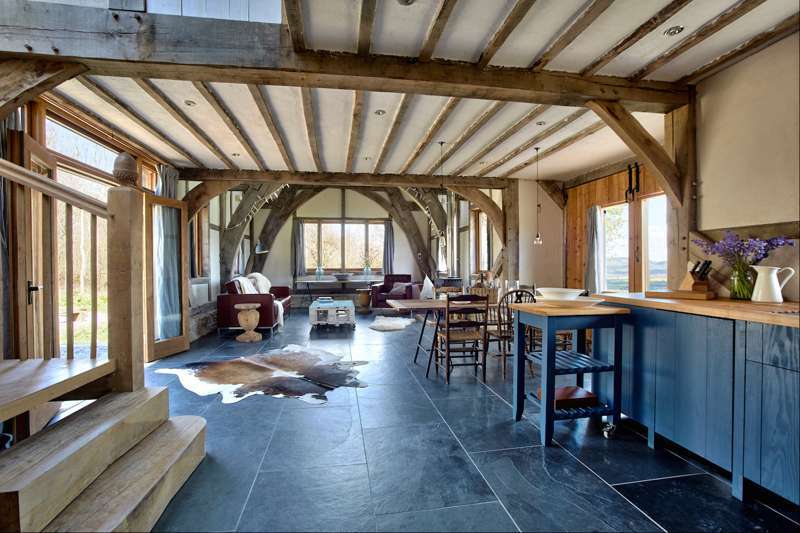 Cruckbarn is also as eco-friendly as you like: natural materials have been used throughout – the beams are fashioned from oak sourced from the nearby forest – and the building has been clad with more timber, reclaimed slates and breathable, old-fashioned lime. It also boasts underfloor heating and hot water provided by a ground source heat pump. It's an amazing structure, and it feels almost a privilege to stay here. There are acres of nearby woodland to explore, an adjoining field to play in, plus access to a fire-pit, hammock, woodland swing and kite – which even novices should be able to fly up here. Wigmore village is just a mile away down the hill, and has a a great foodie pub (The Oak) and an excellent village shop, not to mention the ruins of an ancient castle, and if you have to get into your car Ludlow is just a short drive away. In short it's the perfect place from which to explore this beautiful part of the UK. 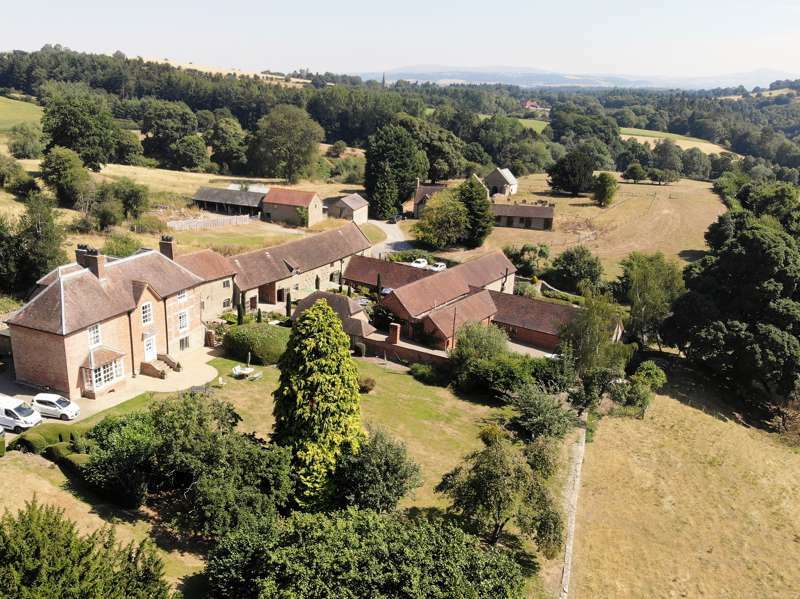 As soon as you arrive at Cruckbarn you will be struck by the impressive views, the beauty of the ancient woodland setting, and the peacefulness of the surrounding countryside. We can’t claim credit for any of what Nature offers, but in building Cruckbarn, we have done our level best to compliment it – using materials from the local area wherever possible. We love spending time at Cruckbarn, and do everything we can to ensure that our guests do too. It’s a perfect spot for walkers, bird-watchers and nature-lovers, but also for relaxed family holidays or a romantic break. We love sitting round the camp fire outside in the early evening, watching the sun set between the trees and conjure up beautiful colours across the views towards Ludlow. On a balmy summer evening, with the barn doors open, the outdoors become seemless with the indoor space. On a crisp winter’s night, with clear skies, you can stargaze around the fire before wandering in to get cosy around the log-burner, surrounded by impressive oak beams. In truth, having put so much effort into making every part of Cruckbarn special, we have a lot of favourite spots! North Herefordshire has an unspoilt charm, being a little off the beaten track. The countryside invites exploration by foot or bike, while National Trust sites such as Croft Castle or Berrington Hall are within just 20 minutes’ drive. It's a great place for bird-watchers, walkers, geologists, nature-lovers… or simply to get away from the stresses of modern life. Kids can try out high rope courses in nearby Oakwood Leisure, or simply get back to nature by exploring the local woods. And if the weather’s in your favour, why not try wild swimming in the local rivers? We are lucky to have lots of great places to eat locally, not least in Ludlow town which has long been recognised for great restaurants and food producers. If we are going to Ludlow, our first choices would be The Green Cafe, Pizza Ten, and the Cicchetti Bar which are all independently run places with great atmosphere and cracking food. Closer to Cruckbarn we have The Oak in Wigmore village, no more than a mile away, which is great for just a drink as well as a meal. The Riverside at Aymestrey, 3 miles away, is very good, and in the other direction, also about 3 miles, is the Lion at Leintwardine – a nice pub by another river! – and The Jolly Frog is a restaurant a bit further along the same road, specialising in seafood. We could go on, there are still more to explore and only a few miles further away. Cruckbarn is a place you can truly relax. It offers a special combination of luxurious accommodation within a peaceful location with outstanding views. It has been hand-built with great care and individuality, and we have applied this same attention to detail in turning it into a luxury holiday home. Come and enjoy the campfire, the hammock, the swing, the kite, the ever-changing view, the walks, the peace, the trees, the wildlife, the wide-open landscapes, and the pretty local towns. We look forward to welcoming you! 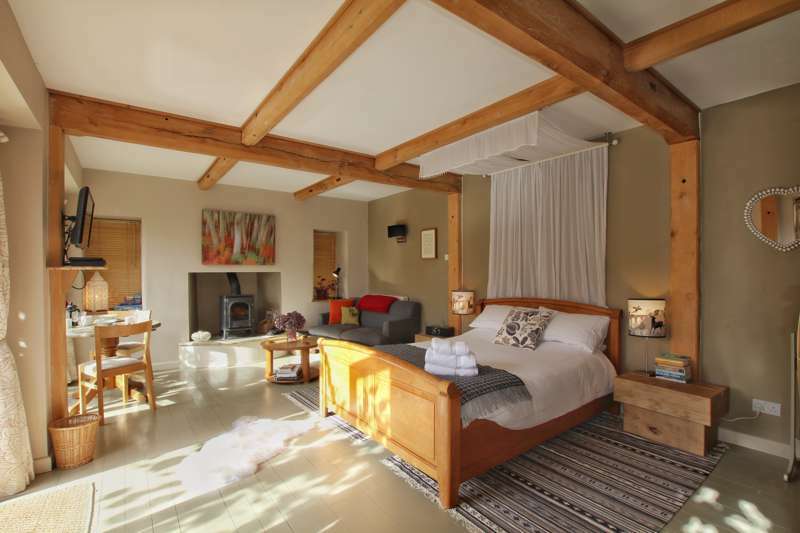 Sleeps up to 5 in two double bedrooms (plus an additional single bed). From £795 a week in low season to £1,195 a week in high season. Midweek stays and long weekends £475–£675.